With all of the different options available to customize your Agent123 website you want to make sure that you present yourself the best way you can. It is best to use the most authentic photos possible. This means no high school photos or photos from ten years ago. Buyers are looking for an agent that they can trust when they make important purchase decisions. Updated photos are an extension of this honesty. Any photo you feature on your website must be an original or you must have purchasing royalties in order to display it. Too often agents use unoriginal photos taken from Google or other agents’ pages. This is not only illegal but you run the risk of racking up legal charges. Too often agents try to get creative with their page and end up with a less than desirable profile layout. Your goal is to put your best foot forward, so make sure to enlist the help of the pros to maximize the look and success of your profile. Professionalism is key when creating a good first impression. Visitors will notice careless grammar errors and may be deterred from your page because of it. Read over all of your profile information more than once to make sure you aren’t making any careless mistakes. In order to ensure originality you need to make sure that your taglines, paragraphs, and bio are your own. Don’t steal the work of others. 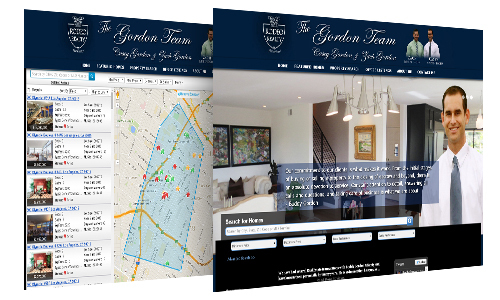 Animated items may be cute to see on tv, but they do not work well for your real estate website. IPhones and iPads do not display flash, so making sure your page is accessible to mobile users is paramount. It can be tempting to get creative and include novelty pages on your website. A limited amount of this is okay, but be careful not to get too carried away with unrelated content. Keeping it about real estate is key. Explore all of the possibilities that website customization can offer by trying out what combination of design and layout best works for you. Knowing all of the possibilities means that you will be up to speed on the latest technology and options. Know what blend of design and function works for you.